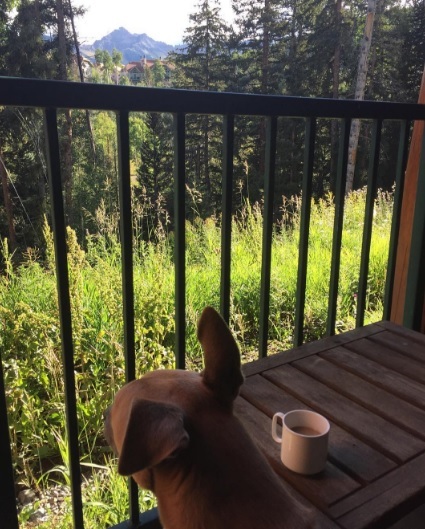 When Los Angeles Times film writer Rebecca Keegan informed her Twitter followers that she was bringing her dog Dude to the Telluride Film Festival for a second time, she asked how she should document the experience. While ‘Get a life, lady’ garnered 19% of the poll vote, the clear winner was Instagram with 68%. And so, for those interested, Keegan’s Instagram and Twitter streams are the places to keep tabs on #DudeDoesTelluride. The spectacular shot above was shared this morning, following the long car drive from L.A.
Keegan’s husband Marty and a dog sitter take turns caring for Dude while she covers the storybook festival. However, there are other times when she can make time for her dog, rescued from the South L.A. Animal Shelter. Nice. There was actually also last year an outdoor screening of Laurie Anderson’s Heart of a Dog, to which pooches were invited, but inclement weather kept the Keegans’ Doberman-lab mix from attending.